When Jim Tressel was first hired by Ohio State in 2001, he promised to beat Michigan. He did. Over and over and over again. Despite being a mediocre coach, the Ohio State university kept Jim Tressel around for many years because he continually beat Michigan. Unlike his predecessor, John Cooper, Tressel knew how to beat Michigan. Looking back at the Tressel era, one finds an impeccable big ten record and absolute dominance. Tressel knew how to beat the big ten. But was he a superior coach or did he have superior athletes? He amassed a record of 94-22 at Ohio State and beat Michigan 9 out of 10 times. That was enough to keep him around. The biggest game he won was the Fiesta Bowl in 2002, against a heavily favored Miami in double over time. But that’s where it all ended. After that big win, Tressel failed continuously in big games. He was always out coached and out game planned. Even when Ohio State would start out winning, his half time adjustments were horrid and Ohio State would end up losing. His teams seemed especially under prepared. This was very frustrating to Ohio State fans, and still is. Watching Tressel’s Buckeyes was boring, and you knew it would end in defeat. Watching golf was the only thing that was more boring than Ohio State football under Tressel. In 2005, when Vince Young’s Texas Longhorn’s came to Columbus, Ohio State’s supremely talented team would lose. Texas’ coach, Mack Brown, was known for losing big games. But he won this one. Apparently, Tressel is worse at big games than Brown. Troy Smith, Santonio Holmes, Ted Ginn Jr. would lose to Vince Young’s team which was without Bo Scaife and Cedric Benson. Troy Smith didn’t start the game and would alternate with Justin Zwick due to a booster giving Troy Smith $500 (yes, it was going on all along). This would be a sign of things to come. Ohio State ultimately lost by a field goal, but Texas controlled the game from the outset. Tressel made no half time adjustments and wanted to just pound the ball and see if the defense could pull out a win. Texas run defense was stout as a rock. Why you wouldn’t want to pass against the underwhelming Texans pass defense when you have Ginn and Holmes is inexplicable. Tressel was afraid to lose and didn’t go out and win. He played small ball and played not to lose. He did not step up and play a bigger brand and bigger style of football on the bigger stage. He reverted to his small ball roots. Three yards and a cloud of dust. It was a a huge nationally televised night game between number one and number four and a record breaking crowd in Columbus. 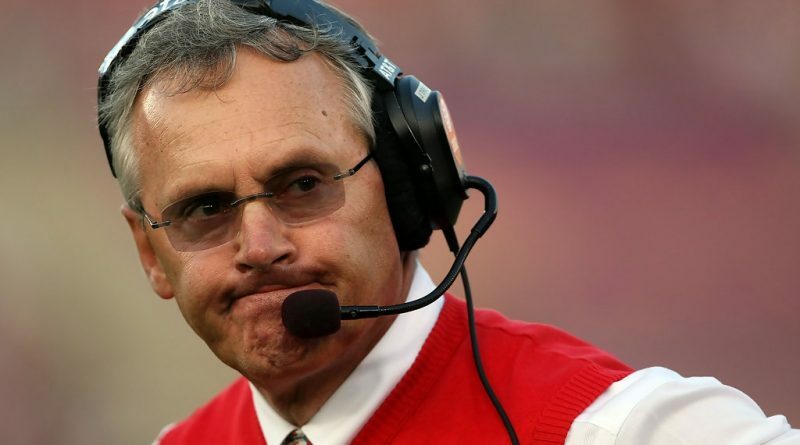 Ohio State fans should have realized Tressel’s ineptitude at this point in time. But the Tressel train moved along. He continued to fall apart and be blown out in big games even with superior teams. The game against Texas was just the beginning. In the 2006 National Championship against the Florida Gators, Tressel’s Buckeyes were dismantled by the less talented Urban Meyer led Gators. After Tedd Ginn Jr. returned the opening kickoff for a touchdown, the Buckeyes would not score again until garbage time and were destroyed 41-14. The Buckeyes were the top team in the country all year long and had NFL talent at nearly every position. The Gators had a starting quarterback named Chris Leak that is no where to be found, were never ranked higher than fourth until the very last week of the season. The Gators were an inferior team all around and the Buckeyes lost miserably. Tressel’s team was under prepared and were hit in the mouth. Urban Meyer’s Gators smelled blood and came out and destroyed the Buckeyes. In 2008, the Buckeyes went to the national championship game again. This time against LSU. On the opening series, Beanie Wells rattles off a 65 yard touchdown run and no one on LSU’s team could tackle or catch up to Beanie. It was going to be a long disastrous day for Les Miles’ LSU Tigers. Matt Flynn and Jacob Hester could not get anything going on offense against Ohio State’s defense. All Tressel had to do was stick to the game plan and keep running Beanie Wells. What does Tressel do in the second half? He comes out with five wide receivers and plays right into LSU’s strengths. The Tigers knew how to defend the spread offense, and Tressel played right into their hands with Todd Boeckman as quarterback and no threat to run. LSU would end up beating Ohio State 38-24. Tressel always picked the wrong game plan. When you had to run, he would pass. When you should pass, he would try to run. It never worked out in big games. He was consistently out coached, out prepared, and out game planned. It wasn’t just big games. How many games against Troy State or Toledo, or Akron or Ohio University did Tressel nearly lose? His coaching style was boring, underwhelming, and always played down to his opponents. It was very frustrating to watch. But didn’t Tressel dominate the big ten? Sure, Tressel had a tremendous run in the big ten. Seven out of 10 years he finished atop the big ten. So how does a mediocre coach dominate the big ten? Just take a look at the big ten. Michigan was always rebuilding with no consistency. Michigan State couldn’t get out of their own way and always found a way to lose. Penn State was mired in controversy and trying to prop up a coach on his death bed merely to break an NCAA record while having issues with child molestation. None of the teams in the big ten had any consistency or talent. Further, Tressel had the top athletes. Ted Ginn, Troy Smith, Beanie Wells, Maurice Clarrett, Will Allen, Mike Doss, AJ Hawk, Laurinaitis, Pitcock, Malcolm Jenkins, Michael Jenkins, Chris Gamble were all NFL caliber talent. That is a small sample of players that played for the Buckeyes under Tressel. No other big ten team had so much talent. It’s easy to beat up on the little guys when they are severely under matched. It was never even close. No other big ten team could draw as much talent. Jim Tressel was a small town coach who got a big break when he was hired by Ohio State. No one at Ohio State thought he’d last this long, but he kept beating up on the big ten, especially Michigan. He inherited a very talented squad, went on to barely beat Miami in the BCS Championship game, and was the benefactor of all that hype and was able to recruit the top athletes in the country. He was a product of circumstance. He squandered it away. He never grew as a coach and never was able to adapt when playing superior teams. Any time the level of competition was more than the usual big ten level, he failed miserably. Even when he had superior talent. He was a mediocre coach mired in mediocrity. Jim Tressel’s teams were never creative. His offensive philosophy was to run, run, run, grind out the clock, and let the defense and special teams win the game for you. He believed that the punting game was the most important part of football. And it is important, but not to the point where you expect to go three and out all the time and consider that a “good series”. The only exciting plays under Tressel were Santonio Holmes and Tedd Ginn Jr. kickoff and punt returns. It was the most boring and lifeless brand of football in the country. He skirted by for many years because he would keep winning. Sure Tressel brought a lot of wins and talent to Ohio State, but he also brought a boring brand of football and scandal. It’s easy to win when your college team is playing against pee wee league level talent. He was a good small ball coach and had enough coaching experience to get by winning small ball games. Whenever faced with a real challenge and even a small amount of adversity, he would lose big.